This is not specific to the forums but the site in general (wasn’t sure where to post), I have a problem with staying logged in to the site. When I want to post a comment on an article I click on the log in link at the bottom of the comments and successfully log in that way, which returns me to the main page. But as soon as I click on the article I wanted to comment on I’m logged back out. Is this a browser issue or something? I’m on Safari. Also, when I log in, the little box in the top left that has my avatar and current level briefly flashes up but then disappears. Any ideas what’s going on? Obviously I’ve managed to stay logged in to post on the forum so it must be something specific to the main page. Moshbag: That happens me too with the main site, sometimes several times a day. I’ll be logged in, fill in a replay, submit it and suddenly i’m logged out. Also, sometimes when the forum says i need to be logged in, and then i attempt to login, it tells me that i am already logged in and won’t let me get around that. Unfortunately i don’t think there is anyone available on the site to work on stuff like that at the moment. This reply was modified 2 years, 3 months ago by _a_chav. Giving a shot for this forum. This is Uth. Well, I’m new here. Hope I could be more helpful and can get news, tips, guides and more about gaming. Hope to hear something from all of you. By the way, I’m currently playing this mobile game names Strikers 1945: World War. This is recently releases a few days ago, May 25th. The game is now available to limited countries for its soft launch release – namely, Canada, Singapore and Philippines. The game will expand to other countries until the slated Global Release. 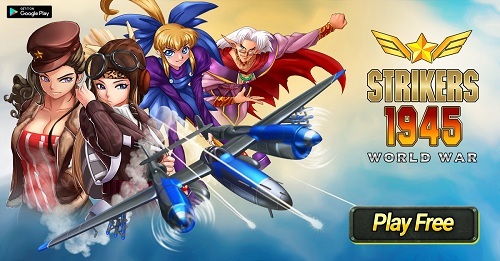 Catch Strikers 1945 – World War’s social media events to kick start the soft launch release. This reply was modified 1 year, 11 months ago by uth702. What happened the sign in? Bit awkward, chaps and, y’know, chappettes.